As I recently wrote, we had a very quiet Fourth of July celebration with just the two of us. We had been gone for most of the week prior and so most of the holiday was spent working in the yard and tackling what seemed to be like a pasture of uncut hay. (Seriously, the lawn seemed like it was three feet high. And the weeds? I won’t even go there). We finished late in the afternoon (read “after a sun stroke or two”) and we escaped to the covered patio to start the evening’s relaxation. I had also already prepped the beverage: Watermelon Wine Spritzer. I had spotted this recipe in the local paper on July 3 and I knew I needed to make it for our Fourth festivities. I adapted the recipe slightly. For the original recipe, click here. Combine watermelon chunks and sweet and sour mix in a blender and process until smooth. Pour pureed mixture into a 2 quart pitcher or jug. Add fruit and wine. Refrigerate for at least one hour prior to serving. If you were wondering what the creature is to the left of the first picture, he is one of my Picc-a-Dilly Gargoyles. My kiddo would love that Picc-a-Dilly (as would I), no matter what body part he’s picking 🙂 I would also love one of those spritzers. It’s in the upper 90’s here this week so we need that kind of refreshing drink. Besides the pickin’ one is also cracked now. LOL. I’ve been in Canada but am heading home to 100 F. heat! How delicious and refreshing—-I love it. What a great spritzer! This is more than just watermelon spritzer. Look at all that other fruit. 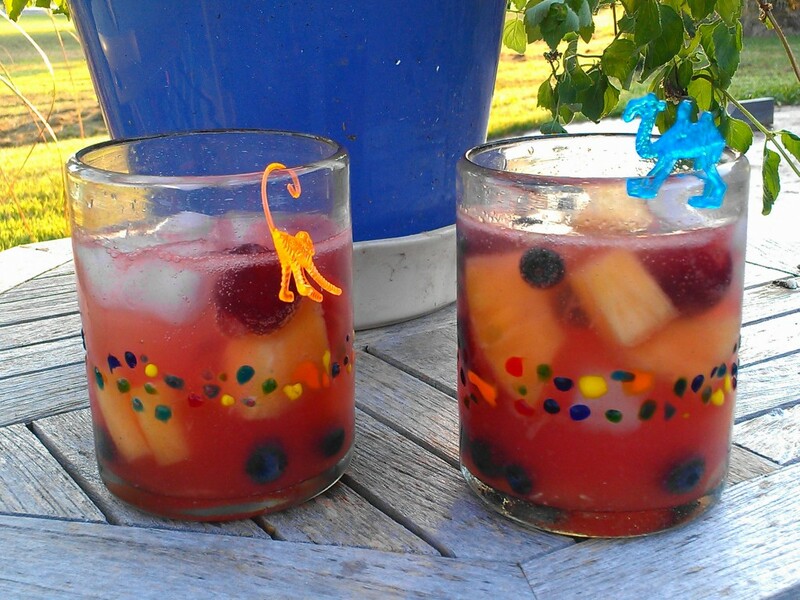 Like a healthy and delightfully light sangria. Love it! Your spritzer sounds really refreshing! I really love all the fruits in there. There’s no doubt in my mind that any one of those garden “creatures” would bring a smile to Marion’s face, lol…As for me, that Watermelon Wine Spritzer would definitely make my day! It’s a hot one today and I have a beauty of a watermelon sitting on the counter just waiting to be tackled! Love all that goodness you added too. I hope You showed Marion and she got a laugh or two. Continue to take care! Love those Picc-a-Dillies! And love this, too — so refreshing. We always OD on watermelon at this time of the year — have it for breakfast every morning, and usually at least once more during the day (the two of us go through two watermelons a week!). Good stuff — thanks. We probably don’t eat as much of this stuff when we should (and can). Hey I remember those little plastic animals on the side of a glass rim – from years ago but I can’t think of where………..like the fair or 6 Flags or something. Anyway, we are eating watermelons like there’s no tomorrow right now. You know, the first weekend in August is the Rush Springs Watermelon Festival so we’ll have even more soon! I want to make this because the pineapple is something new and different that I’ve never had in a drink like this! I know there was a drive-in in Stillwater that had them back in the seventies. I want to reefer it as a sonic. ??????? 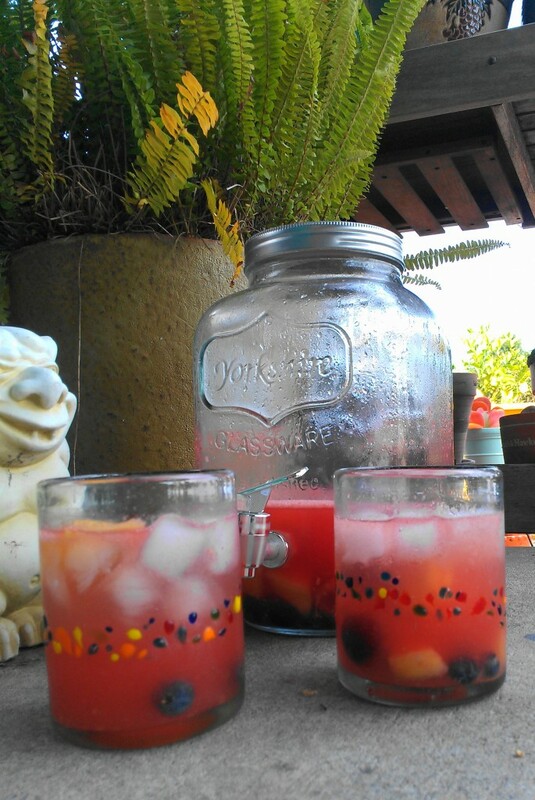 Beautiful drink and so Summery. 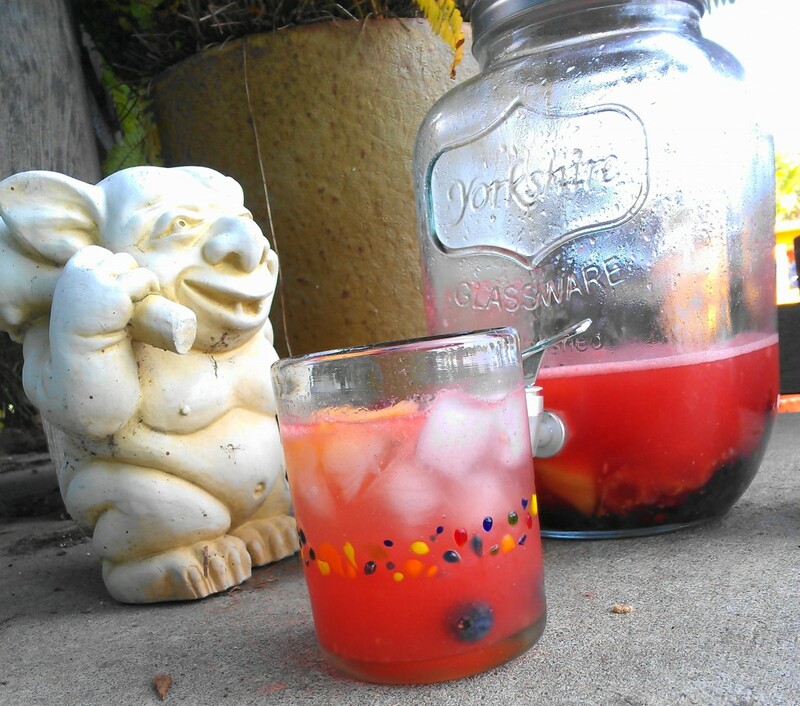 And tell that little gargoyle he’s pretty darn cute, along with those little critters hanging from the glasses. Oh, boy, does this sound like the perfect summer sipper! Love all the fruit in the recipe—so tasty! It’s 7:30 in the morning and now I already want to start drinking!